Over the years, NAHB has periodically conducted “construction cost surveys” to collect information from builders on the various components that go into the sales price of a typical single-family home. NAHB’s most recent Construction Cost survey (conducted in September of 2017) shows that, on average, 55.6 percent of the final sales price goes to construction costs, 21.5 percent to finished lot costs, and 10.7 percent to builder profit. Construction cost includes all the costs paid by a builder, including costs of materials, labor and subcontractors. The following sections describe the methodology of the survey and discuss the results in more detail. NAHB’s 2017 Construction Cost survey was conducted by emailing a questionnaire to a representative sample of 4,267 home builders. The sample was stratified by the size of the builder (based on the number of 2016 single-family starts) and by region of the country (the sample being proportional to housing starts in each of the four principal Census regions). The survey asked builders to break down the price and construction costs for the typical home they built in 2017. Over the years, NAHB has modified the survey and its methodology. 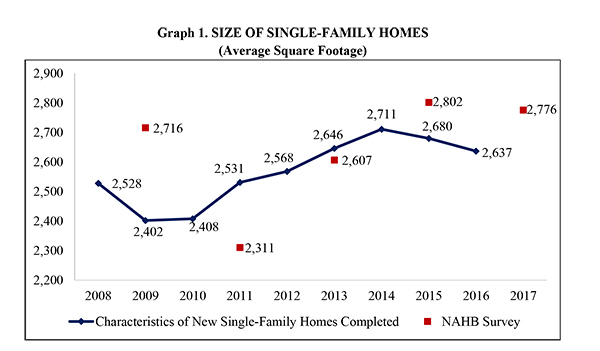 In 2009, the survey methodology changed to provide a better, more representative sample of single-family construction across the country. In 2013, NAHB developed a different construction cost breakdown that more closely resembles the steps that builders take when building a home. Prior to 2013, the breakdown had 29 sections. In 2013, we created eight subcategories for each of the major stages of construction, with a total of 36 sections grouped under the appropriate construction stage. The new format simplified data collection, greatly reducing the number of follow-up calls needed to clarify and verify builder responses. Respondents were asked to provide information about the typical single-family home built by their firms during 2017. Usable responses were received from 44 builders. 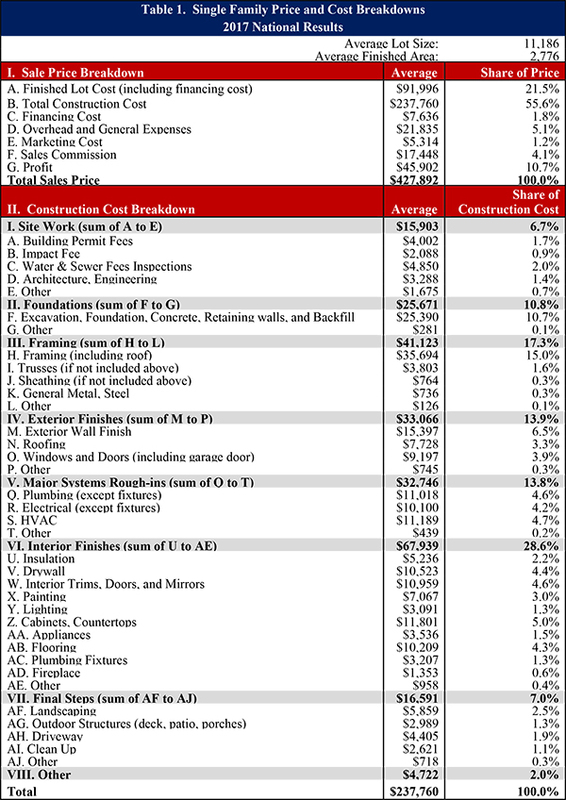 Table 1 shows the detailed results of the 2017 Construction Cost survey. These results are national averages; the survey sample is not large enough for a geographic breakdown. Building practices, the cost of labor, the cost of land, and to some extent the cost of materials can vary from place to place and depend on the nature of the particular home being built. Builders generally cannot provide a breakdown of labor and material costs due to the widespread use of subcontractors who sometimes are and sometimes are not responsible for purchasing materials. Consequently, each cost line in Table 1 includes all the costs paid by a builder that go into a particular item, including labor costs paid directly by the general contractor, the cost of hiring subcontractors, and the cost of materials, however they are purchased. Although the NAHB survey can provide a broad idea of construction costs for the average new single-family home, it is not a perfect tool for estimating costs for a particular house. Companies that provide more specific cost estimating, usually for a fee, include RSMeans and Marshall & Swift - CoreLogic. It is also important to note that because the NAHB Construction Cost Survey has a small sample size and does not control for differences in the types of homes submitted in builders’ responses, users should exhibit caution when comparing results across multiple years. For a more accurate time-series, users should refer to the Census Bureau’s Characteristics of New Single-Family Houses Completed which is based on a much larger sample drawn in a statistically representative fashion from the Census Bureau’s data base of permits issued in 20,000 jurisdictions. The average single-family home size in the 2017 NAHB Construction Cost Survey is 2,776 square feet of finished floor space. Historically, average square footage in the NAHB survey has tended to move in the same direction as in the Census Bureau’s series with a lag, and with wider fluctuations, as you would expect from the smaller sample size. The Census data show a drop in the average square footage during the Great Recession (from 2,528 square feet in 2008 to 2,402 square feet in 2009), then a steady climb to a record high in 2014 (2,711 square feet). After 2014, the average size started to inch downwards and stood at 2,637 square feet in 2016 (Graph 1). The average lot size in the 2017 NAHB Construction Cost Survey is 11,186 square feet, or about a quarter acre (1 acre is equivalent to 43,560 square feet). This is the smallest average lot size recorded in the survey’s history. The average lot size was in the territory of 20,000 to 22,000 square feet in 2009 and 2011, but dropped to 14,359 in 2013. It rebounded to 20,129 square feet in 2015. 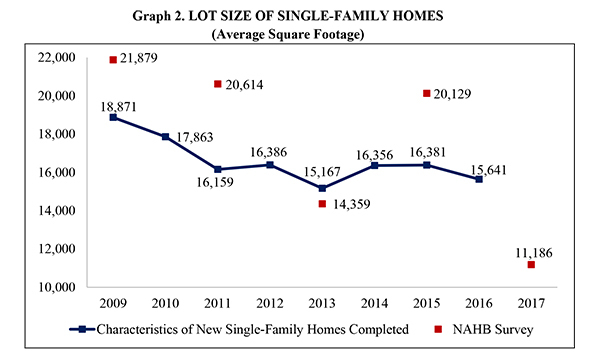 In general, lot size in the NAHB survey has tended to move in the same direction as the Census series, but again with more volatility from year to year. In 2009, according to the Census data, the average lot size for new single-family homes completed stood of 18,871 square feet, before falling to 15,167 by 2013, edging up to 16,381 in 2015, and dropping again to 15,641 in 2016 (Graph 2). One reason lot sizes may be dropping is the serious problem many builders have been reporting finding available lots. Responding to special questions on the survey for the NAHB/Wells Fargo Housing Market Index in July of 2017, 64 percent of builders reported that the supply of lots in their markets was low or very low (as reported in NAHB’s Eye on Housing blog). Only 9 percent of builders reported the supply of lots as low or very low in 2009. The average single-family home sales price in the 2017 NAHB Construction Cost Survey is $427,892. 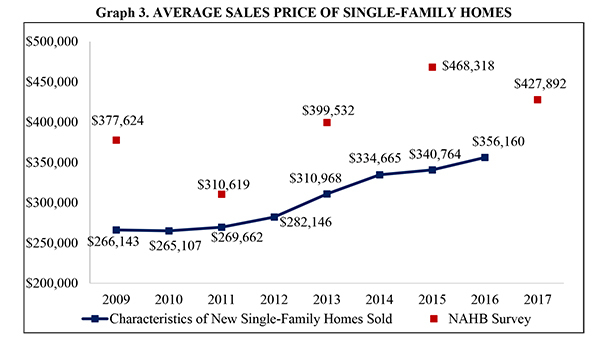 The Census Bureau’s series shows the average price for new single-family homes sold increasing steadily after the Great Recession, going from $265,107 in 2010 to $356,160 in 2016 (Graph 3). Compared to the Census series, the NAHB survey data show bigger jumps in the average price. Again, the larger fluctuations in the NAHB surveys are most likely due to the smaller sample size. The relatively simple geographic stratification (four Census regions) may also be a factor. It is possible, for example, that the lower average price in 2017 compared to 2015 is the result of a higher share of respondents coming from lower cost areas in each region. A key feature of the NAHB survey is that it asks builders to break down the sales price of their homes into seven categories: finished lot cost; total construction cost; financing cost; overhead and general expenses; marketing costs; sales commission; and profit. Table 2 contains historical information on the sales price breakdown of a single-family home. It is important to remind readers to use caution when comparing data across years in Table 2, as trends may be affected by the survey’s sample size limitations and the fact that a different set of builders responds to the survey each time. On average in the 2017 NAHB survey, 55.6 percent of the final house price was attributable to construction costs, 21.5 percent to the cost of the finished lot, 5.1 percent to overhead and general expenses, 4.1 percent to sales commissions, 1.8 percent to financing costs, 1.2 percent to marketing costs, leaving 10.7 percent for profit (prior to taxes). Construction costs accounted for a larger share of the average price in 2015 than in 2017 (61.8 percent vs 55.6 percent), while finished lot costs went from accounting for 18.2 percent of the sales price to 21.5 percent. Yet for reasons aforementioned, this historical comparison may not be appropriate. In addition to Construction Cost surveys, NAHB’s Business Management Department sponsors the builder’s Cost of Doing Business (CODB) Study, which is based on the income statement and balance sheet for a builder’s entire business, rather than the builder’s typical home. Historically, compared to the Construction Cost survey, the CODB has tended to find a lower rate of profit. In the Construction Cost survey, profit is based on a home that is assumed to be sold, whereas the net profit in the CODB takes into account homes that have both been sold and those that haven’t. Also, it may be easier for a builder to report total overhead costs as well as indirect construction costs in the CODB than to allocate these costs to a particular house in the Construction Cost survey. The average construction cost of builders’ typical single-family homes in the 2017 NAHB survey is $237,760 (Table 3). 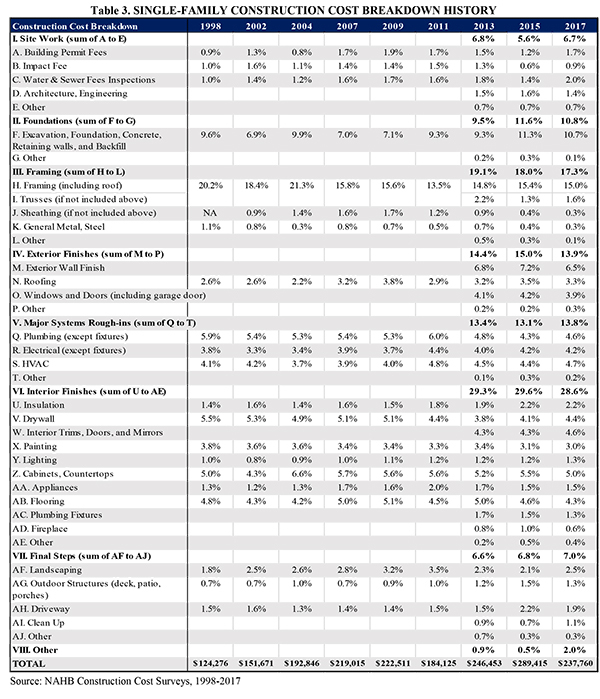 Of the 8 major stages of construction, interior finishes, at 28.6 percent, accounts for the largest share of construction costs, followed by framing (17.3 percent), exterior finishes (13.9 percent), major system rough-ins (13.8 percent), foundations (10.8 percent), final steps (7.0 percent), site work (6.7 percent), and other costs (2 percent) (See Table 3 for a full breakdown). Of the detailed items in the NAHB survey, framing and trusses remain the largest share of construction costs. Together, they account for 16.6 percent of 2017’s construction costs – essentially unchanged from the 16.7 percent they represented in 2015. The share of construction costs that goes to fees and permits (building permits, impact fees, and water/sewer fees), on the other hand, rose from 3.2 percent in 2015 to 4.6 percent in 2017. A 2017 Eye on Housing blog shows that impact and inspection fees are becoming a significant challenge for more and more builders: Impact/Hook-up/Inspection or Other Fees were a significant challenge for 46 percent of builders in 2013, compared to 61 percent in 2017.